If fact, it was made from metal and appeared in 800 Gears. Motor and Bricks, released in 1970. It was designed to connect the new gears in the set to the existing train motor, which accepted the metal axles of train wheels. That set also introduced the cross-axles that are still in use today. The first six Technical sets, as they were called at the time, introduced many new pieces including beams, gears and connectors. This humble pin was among them. It was used to join beams together as well as at rotation points. Being frictionless, the resultant structures could be a bit floppy. It's only ever been produced in light grey: old light grey prior to 2004 and light stone grey afterwards (from now on when I refer to light grey I'll mean both colours). It's still in use where rotation is required. A year later this frictionless pin made its first appearance in 855 Mobile Crane, to mount wheels with axle holes to beams. Originally it was mostly produced in light grey until being entirely replaced by the tan version in 2004. There have also been black ones, in two space sets, and BrickLink alleges that a white version appeared in some versions of 8558 Cahdok and Gahdok although I believe the vast majority contained the friction version. This pin seems to have been originally designed for holding toothed angle connectors together in the 1981 Technic assortment, as can be seen clearly on 8845 Dune Buggy. That piece is now obsolete but this pin enjoys life nowadays as a means of interfacing Technic and System parts. Until 2001 it was exclusively light grey but since then both grey and blue versions have been in use. Interestingly, the blue version appeared only in System sets until 2004, after which it also cropped up in Technic. It was also produced in white for a few sets released 2003-2005, most notably in 10042 U.S. Flag where they were used for the stars. The original frictionless connector pin resulted in floppy constructions which must have been seen as a problem in the increasingly complex Technic sets of the early 1980s. This pin enabled beams to be connected together very securely. In fact, so securely that it's extremely difficult to get them apart again. The only way to remove this pin from beams is with pliers or teeth. If you come across any, throw them away, do not mix with the later version or you will regret it! Technic fans of the 1980s had to risk breaking their teeth for 8 years before the awful version above was replaced with this usable one that we know today. Like many of you, I suspect, I own more of this part than any other LEGO piece. Officially, it's only ever been made in black but there seems to be a whole range of colours available on BrickLink, including transparent. Presumably they are LEGOLAND model shop or factory escapees. The 3 long friction pin first appeared in three 1993 Technic sets, in black. Pins and axles were either grey or black in those days which made sorting and locating all the more difficult. Clearly LEGO saw this as a problem too because it was phased out in 2008 in favour of blue. I understand, from conversation with a System set designer at the time, that they were not happy about it because it had often been used for gun barrels and similar. Let's not forget the solitary white one! When researching this article I was surprised at how late this one -- for connecting to half-width parts -- appeared, given that the first half-width liftarm (2825/32006) had been around since 1989. The original dark grey version was superseded by tan in 2013. This one, that has an axle hole in the end, has been produced in 13 different colours although nowadays only appears in black, red and light grey. I believe its original intended use was as a pin that can be easily inserted and removed to join subassemblies because its first use was in 8277 Giant Model Set which built various modular models. 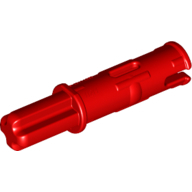 Eight years after the friction version was produced, this 3l pin surfaced first in four Bionicle sets in 2001 before finding more widespread use the following year. It was originally light grey before being switched to tan in 2008. This is another one that arrived relatively late, given how prevalent it is nowadays. It was originally black, which must have made finding it in a pile of similar pins nigh on impossible, so thank goodness it was changed to blue just a year after its initial production. A white version was used for the teeth of Bionicle creatures in 8558 Cahdok and Gahdok, in 2002. Twelve years passed before a 3l version of the pin above was produced and it's now used in just about every Technic set. Until late last year it was produced only in dark grey but now it seems that it's been switched to red. I wonder how they decide what colours to standardise pins in...? I guess it was inevitable that this one would follow the one above given how useful it's proved to be. I love this kind of article, though I'm sure everyone I'll eventually burden with this knowledge does not, and I'd love to see more brick history in the future! Keep 'em comin', Huw! Great article! Please do more like this for parts of all sorts! I thought the blue version of 4274: Connector Peg W. Knob was a friction variant though? ^ No, they are both non-friction, otherwise it would have a different design ID. What is the difference between 6562 and 43093. They look the same to me!? Also, I have some old style friction peg 4459 and I don't find them that difficult to get out with the axle part of a brick separator. 6562 spins round in the hole it's inserted in, 43093 doesn't. Always love a good parts post. Interestingly, there's a variant of 2780, regular black pin, that Bricklink doesn't seem to note: It looks the same externally, with the slots and ridges, but it has thicker walls, which gives it a smaller interior diameter. While a normal 2780 slides easily onto any 3.18mm bar, these guys won't budge. I sorted the few that I have out from the rest of my pins a while ago, it's too annoying to grab one of them when you want to use that connection. Thank you, Huw, that was great! As someone who deals predominantly with Technic, I'm familiar with most of these pins (not so much the old ones), but if nothing else, this article means I know know what they're all called! Be great to see some more articles like this if you have the time though. Please do not refrain from writing more articles like this if the inspiration strikes again! On another note, is there any reason for linking to the parts on Rebrickable and Bricklink, when Brickset also has pages for them? That was an enjoyable article! It would be nice to see different colors for the same pin model. But when e.g. a Technic structure is used as a skeleton for a system set, specially the blue and red pins are sometimes to striking. A recent example that comes to mind : the 75220 sandcrawler..
Nice and interesting background article btw.. Agreed that I love these kinds of articles. This was excellent and interesting reading :). Another excellent article Huw, please keep up the great work! Now if you ever find yourself tiring of this kind of article, maybe you could mix it up with the occasional article about the history of lesser known themes. @SirZed, asked "is there any reason for linking to the parts on Rebrickable and Bricklink, when Brickset also has pages for them?" Often, for information about older set inventories, and thus parts usage, BrickLink will be more comprehensive than here. And, as we have an affiliate relationship with BrickLink it doesn't hurt to send some traffic their way! I don't think I've linked to Rebrickable, have I? Great article. Brick history is important. I will always enjoy reading articles like this. Always interesting IMO. Thanks for it and the time passed on research that was probably necessary to gather those historical data and informations. Thoroughly enjoyable lunch break reading this, thanks Huw! Maybe I’m misremembering and thinking of a short axel, but I think there was a part that was metal and cross its whole length. This stuff is so fascinating! I could read about the history of Lego parts and sets all day long. This was way more interesting than it should have been. There's a question to be asked here about LEGO's polocy regards colour on pieces like these. They seem to standardise the colour on fiddly pieces that might get easily confused; but then they break that rule for special occasions. One wonders what it takes to get such a recolour. 32054 has started making a comeback in orange - it's in quite a few recent sets. I echo many of the other commenters in thanking you for a wonderfully interesting and informative article. I'd like to add that #32054 definitely also comes in orange: I have these in both the Mountain Cave 21137 and also the Bugatti Chiron 42083. I love these detailed articles. It reminds you that there are real Engineers doing detailed design work behind the scenes. Being a child in the 70s, I’ve grown up seeing the progression of the Technic sets. I love this kind of article as there’s always something new to learn. Those #800-1 sets appear now and again on Ebay reasonably cheaply. I've bought three over the last year and a bit, and the gears and translucent axles are great to play around with. Haven't found much use for the metal pins. The 2x4 Technic bricks are great though, and Duplo has a similar piece, allowing you to make virtually the same build in two different scales, which is interesting if you're into that kind of thing. Odd how the 2x4 Technic brick didn't last very long at the system scale but has persisted until now at the Duplo scale. Edit: the sets I've bought were #801-1 not #800-1 but they contain much the same thing. Love these kinds of articles. Mold variants would be interesting too! Had multitudes of all the other plastic ones, though... that's what comes of being an avid Bionicle collector for many years, I suppose! I even had maybe three of the old-variety friction pins that I guess I must have got second-hand... and, like you said, I quickly learned to avoid using them when at all possible. Thank you Huw! This was very interesting to read. Articles like this are one of the main reasons I value Brickset above other fan-sites. Anyone can (and does) post reviews and announcements, but Brickset takes fandom one step further and researches and writes about the details like this. I'm very excited to read more articles in the future. Just to add to the pile: I liked reading this post (and the white pin one too! ), keep them coming! ?? I know! I was thinking exactly the same thing! I'm not a Technic collector (although TBH I like it quite a bit), and I have almost every one except for a few of the old ones, and then I get to the bottom of the article, and I'm thinking, "Wow, how did I not even know that TLG makes these?" @bekuehn: I know - that's just one of the many reasons why Brickset is my favorite fan-site ever! Beware buying black 6562 friction-less pin/axle on BrickLink, experience has shown that many of them are actually 43093, the WITH friction variant, that have been misidentified by the seller. Part of the problem I think is that the stock image for the 43093 shows a black one, and the friction tabs are quite hard to see. Totally agree with you on the early friction pins, 4459. I must have picked up a few of these in a recent BL order, I was actually looking at it wondering if it was a non-Lego brand! Only for use in a permanent model! @Huw I agree with the crowd's comments about loving these types of articles. I'd appreciate seeing one about the change in the underside of bricks and plates and the resultant subtle differences in clutch - for example, the 2x2 macaroni brick has been around since 1955 but was just redesigned only a couple of years ago with a reinforced underside. Same with the subtle changes in the curve of arch bricks. This is why I love Brickset; keep it up! I love reading articles like this. Lego has such interesting history/evolution! I was one of the first LEGO technic buyers in 1977. Then already I was thinking of different pins that should be made. One of them was 6562. Same thing with some connectors that were missing in my opinion for my projects back in the late 70's. 61184 Technic, Pin 1/2 with 2L Bar Extension gets no love? One of the strangest pieces ever and has appeared in Technic sets. Just came to mind cuz I have a strange fondness for this strange element! It's like a piece within a piece. @Huw You are right, my mistake. I opened the set description page https://brickset.com/sets/800-1 and the link to the motor part from the same paragraph and the images on the parts page were referring to Rebrickable. ^^ No it doesn't! It's a flick fire missile with Technic pin connection, not a proper Technic piece! LEGO actually considers it to be a 'System' piece rather than Technic, too. ^ Right... yes we show Rebrickable inventories if a LEGO one is not available. We are not permitted to show BrickLink ones in that way. Good article. I'd rephrase the part where it says 11214 has been "switched" to red, though—both the grey and red ones have been in use for the past two years so I think we can safely assume that the red ones have merely been introduced as an alternate color, much like the red and yellow cross axles in recent sets, rather than as an outright, across-the-board replacement like the earlier retirement of black 2M pin-axles. Wow, I didn't realize that Bionicle did introduce a couple of now commonplace Technic pieces. The 3l frictionless pins were in some of the first Bionicle Rahi I built (which were also some of the first complex Technic I'd built) so I've been taking them for granted this entire time. I've also enjoyed the exclusive white pins and axles from the Bionicle Bahrag sets. Anyway, thanks for the article. ^^ it's red in all of this years Technic sets but dark grey where used elsewhere. I guess we'll see in a year or two if the switch to red is permanent. Except now I have to sort them. Ugh. "If you come across any, throw them away, do not mix with the later version or you will regret it!" At least try to sell them on bricklink. There are people that actually want that specific variant for older sets and also for heavier designs, and they sell significantly higher than the normal one. I too was looking for 61184, and also 6628, 87082 and 15100. This article is useful for a variety of reasons. Not least of which, it gives us a sense of where LEGO is going in terms of part colors, designs, and usage. Yeah I can't agree with the advice to throw away any Lego piece, no matter how outdated. Thanks for this article @Huw! Love to see one about the evolution of LEGO gears, especially considering we seem to be coming back round to the original design in some new sets for 2019. @Huw I enjoyed this article. Please do more like it. Windows. Doors. Wheels. Tires. Etc. Nice article Huw! I was surprised by how interesting this was. Keep up the good work! ^^ My expertise is in Technic parts so I might have to call upon others to contribute articles on other parts families. Any volunteers? This was way more interesting to me than it should have been. And I don't even collect technic. What exactly is the difference that makes the original friction pin so hard to remove? It doesn't compress in the middle so it fits very tightly in the hole. Very good article! I am surprised to learn that the 1M pin with stud is older than the 2M pin with friction ridges. No mention of 6628, though? I mean, it was introduced for Technic steering assemblies. And even though its since been used all kinds of ways in System sets, I think it can still be pretty unmistakably be called a Technic pin. Technic also remains the theme where it's been used the most extensively. As somebody who was still a kid in the days of many of these pins' introduction as well as their replacement with color-coded variants I have a pretty strong appreciation of it. Sure, you can avoid the inconvenience of rarer pins getting lost in piles of near-identical common ones by sorting, but that's a much bigger inconvenience than most kids are ever going to undertake. And I feel like it's not too difficult to design a model so that the current pin and axle colors are not an attention-grabbing eyesore. Sometimes I feel like they even add visual interest. And when a set or MOC does look "ruined" by too many teeny tiny spots of color, I think it often speaks more to poor design decisions by the creator than LEGO's failure to provide them with enough pin color options. Even when building digital MOCs (which is the case for a lot of the MOCing I do while at college), I find it convenient to color-code the parts much the same they would be color-coded in a current set. Not only does it make it that much easier to differentiate between which parts I'm using where, but it also means I can generally count on the parts in those colors being readily available at low prices if I decide to build the models in real life. Excellent article. I call those things "rivets" and I'm pretty sure I still have some of the old metal ones somewhere. Huw, these recent articles about pins or digging up out the old Star Wars constraction figures have been some of my recent favorites. Thanks! You got axle pins, but no pin w/ towball, no double-pins w/ axle hole, and no pins w/ pin hole? I also see that there are two other metal axle pins besides the one listed. One is longer, and the other has a D-shaped section of pin that interfaces with a motor apparently. There's also no mention of how these interact with bars, which can be a critical issue for aesthetic purposes (I used this trick to make the pupils on Pixar Cars eyes, and the recent Creator shark set even uses it in an official design). As Rob42 noted, they updated the 2L friction pin to allow a bar to pass through completely, where before the hole was way too narrow. Besides the modern 2L friction pin, the 1/2 pin and 3/4 pin are, I believe, the only ones that allow a bar to pass through completely. The 2L pin and maybe a few of the axle pins allow a bar to be inserted partway, and the 3L friction pin has a tiny rectangular hole that's maybe 1/2 as large as the cross section of a bar. I was fully aware that I own the earliest examples of the friction axle pin (all told, I probably own at least 2000 in black, and still have around 300 in sealed Nuhvok Va sets), but I never knew Bionicle was the first source for frictionless 3L pins. Given all the pantograph action going on in some of those Rahi sets, it's not a surprise that they felt it was a necessary addition, but it's interesting how different the design is compared to other frictionless pins. Not only is it the only pin that features a dome-shaped bulge, but that bulge is also the only instance of a 3L pin that has a distinct stop point on the 2L side. The axles and pins are all color locked, so there has to be a clear aesthetic quality that's ruined by the default color. Cahdok and Gahdok are a great example of this, as they came out right after the friction axle pin's brief foray into the awesomeness of black was ruined by being color locked into vibrant, impossible-to-not-see-on-most-models blue, but they got white because they were used for teeth. BTW, it did not appear in frictionless for this set, as they used axle pins and 2L axles for the teeth, and the axle ends were always the tooth part. Using a frictionless version would have made several of the teeth loose, and they were used to chomp the masks off the early Toa characters. A lot of people just miss that there are frictionless/friction variants and just mislist them under the wrong catalog entry. The earliest Technic sets all relied strictly on Technic bricks, so they were able to use a combination of plates and vertical bricks to reinforce the design. The downside to this is that it's incredibly bulky compared to what you can do with beams, but beams needed the friction for stability. At then at some point in needed a certain 3x3 connector block with four pins sticking out of it to allow you to do certain transitions without needing to go back to the bulky cross-bracing days. One that I'm sure you'd be able to appreciate is that the earliest Bionicle piece to hit US shores didn't even debut in a Bionicle set. The original Toa (released summer of 2001 in the US, and a bit later in Europe) used a torso block that actually first appeared in the Technic Stormtrooper's chest (available to purchase as early as December 2000, if you got lucky). What an interesting timeline! It's pretty neat that most of these parts are still in production, especially given their age, though I suppose the same can be said for bricks! These elements are always so useful, whether it's for actually keeping a structure together or adding rotation, or adding greebling such as the aforementioned Bahrag teeth. Love 'em to death, just wish they weren't so easy to loose! @Purple Dave, there are plenty of parts I could have included given there's no official definition of what constitutes a pin, but I had to draw the line somewhere! BrickLink considers the parts above with cross-axle sections to be axles, but to me they are pins, whereas it does consider this one https://brickset.com/parts/design-15100 to be a pin. Personally, I would call that a connector not a pin. This article was great. I really enjoyed learning more about this. Definitely keep up these types of articles. Maybe next could be an article about all the various 1x1 tiles and plates in various shapes. Very interesting Huw. Many thanks. Great and so interesting article! Thank you very much! My info shows a 1988 release for 2780, FWIW. I could be wrong. That makes the most sense contextually for 2780, and seems to match the number of 4459 versus 2780 pins I own (since I own about 200-300 pins from 1988-1989 and my 4459 supply seems much more limited than that). 6562: Connector Peg/Cross Axle... 1st appeared in the Mobile Crane? A set I had built many times at my grandparents. Pop had the crane while I got the tractor. Very cool to know. So the only ones made in black can only be found in 2 old space sets. Had no idea they were so rare. Nice to know that I have a full set of black ones! so whats the difference between 43093 and 6562? Interesting read alright! I disagree on the comments about colour though... I absolutely hate this colour barf. Yes, makes sorting easier but man does it make models look awful. I would love to go back to all pins in black and grey. ^^ One spins round in holes easily, the other doesn't. This was surprisingly interesting. We actually have part No. 32002 in dark grey. I had no idea it was replaced by tan. This is a great article, sad as it may be, i’d Love to read more stuff like this. I never re think about Technic pins as I am using them and rarely think about the different colours or functions. The 6562 axle pin has an alternate variety not recognized by Bricklink. The oldest light gray versions had a notch at the end of the teeth on the axle end that made that end very tight and hard to remove. Later versions have a smooth axle end. So maybe its a bit late to point it out now, but I just remembered that there's actually another variation of the friction peg. It looks almost identical to the modern one, but its thicker and doesn't fit a 3.18 shaft in it. Im not sure when the change was made (I only noticed in 2016 that the pegs now fit shafts in them, but Im sure the change was made long before then) but the first few waves of bionicle at least used the thicker variety.